In 2014, South Carolina joined 45 other states by implementing a statewide ban on texting while driving. While the punishment remains low compared to other states, it is a significant step towards making our roads safer. Police are now empowered to issue primary citations for drivers who use their phone for texting and driving. The fine is $25 for the first offense, and $50 for subsequent offenses. Using your phone for voice calls or GPS navigation is not included in the law. Although many of us believe we can safely operate our vehicle as we text or check emails, this is simply not the case. A Harvard Center for Risk Analysis study on the dangers of texting and driving noted that texting drivers are 23 times more likely to be involved in an accident than non-texting drivers. If you were hurt or if a loved one was killed because another driver was texting, you deserve justice. For a free consultation of your claim contact Harbin & Burnett today by filling out the free case evaluation on the right. Using a cell phone while driving is irresponsible behavior at the heart of many auto accidents, and the trend does not appear to be declining. Every day in the United States, nine people die as a result of distracted driving and more than 1,060 are injured. This information from the Centers for Disease Control and Prevention (CDC) illustrates the need for regulation of hand-held devices but, more importantly, it offers a glimpse into the consequences of texting and driving. In the time an average driver takes to read or send a message they have already traveled approximately 100 yards, or the length of a football field. In that time, a vehicle can be hit with full impact, which is why texting and driving accidents are very often violent and devastating for the victims. In less than 5 seconds, distracted driving can end or alter lives forever. 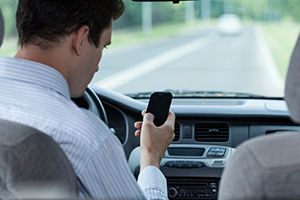 Using a cell phone while driving should not be taken lightly. There are three main categories that distractions fall into, and they each impact a different aspect of a persons ability to drive. In part, this is what makes texting and driving accidents some of the most deadly. Slowed response, or in some cases a complete lack of corrective action, means more serious impacts, leading to critical injuries or deaths. At Harbin & Burnett, we believe that victims of auto accidents deserve justice. If you were injured because of another persons reckless behavior, you may be eligible to file a claim. We are ready to answer any questions you may have about the process and seek the maximum amount of compensation available to you. We have obtained favorable case results for thousands of clients in wrongful death cases, drunk driving accidents and numerous other personal injury cases. To see how we can help, fill out the free case evaluation form or call us at 1 (888)821-0247.